Clean Room Data Recovery Training is one advanced data recovery training course where the full hands-on operations should be taken in real qualified clean room. Those small and middle-sized data recovery companies usually use some clean benches with air purification devices and big sized data recovery companies set up their clean room and clean room working rules and a full set of professional clean room components. Why? Because they need these to handle a lot of clean room data recovery cases and have higher data recovery success rate. Clients may find many self-claimed data recovery experts who claimed they are able to offer clean room data recovery training courses but after the clients joined their training courses and leave the training classroom, they fail to handle alone the clean room data recovery cases and they prove 0 understanding the real reasons. It might seems easy to see other clean room data recovery engineers to deal with the cases and recover the data from the dead hard drives but when it comes to your hands, the result is quite another even if you may think you’ve done the same. Now let’s come into details what kind of training courses can be really professional clean room training courses and how can we make best use of the training courses. First, we must understand what is clean room data recovery? Clean room data recovery is referring to the data recovery cases you should perform within clean room due to the special design of hard drives. When hard drives get physical damages in its inside components such as its platters where the data is stored or the R/W heads or the spindle motor, you need to disassemble the hard drives and find the donor heads to replace or find a donor hard drives to remove the platters onto or you need to replace the spindle/the bearing while keeping the heads, dumpers and platters in place(This usually happens for Seagate 7200.10 and 7200.10 hard drives with a high-success-rate of physical data recovery.) Sometimes before you are performing the platters swap or spindle replacement, you need to unstuck the motors if the motors are not completely stuck and dead and this enables you a higher success rate. Each minor mistake or inexperienced operation may cause a failure to the result. 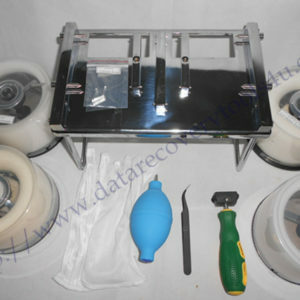 For hard drives with multiple platters and platters with dumpers which are used in many new drives for air cooling, these cases are even more difficult and it requires more skills and practices and also professional head and platter or spindle replacement tools. 4, If the data is overwritten or further damaged by the first party you send your drives to and these cases are mostly unrecoverable even if we may get the drives work again but data is permanently lost. As for our clean room training class, this is a completely hands on class. We have precision head swap and platter swap tools the professor will use in the class. 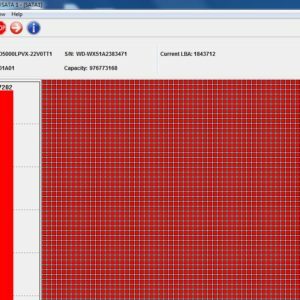 We have a stock of over 100 different HDD that can be used in this class to swap out heads and platters on it. This class is designed where the students will have the HPE work bench to mount the drive on it and use the precision head swap tool to remove the head and replace them with donor heads. It is not possible for us to teach this class with paper and expect a student to succeed in removing and replacing heads with paper. Heads is one of the hardest aspects of DR to get right and if you make any mistakes on this one your drive is gone and you can not get off data. The instructor will speak with the student on the first day. he will demonstrate the techniques in using the precision tools. On the second and third day the entire day is spent on only working on head removal and replacement by the student. On the 4th day the instructor will work and teach his students how to remove platters, single, multiple platters. In the afternoon and last day of class the students will only work on platter swaps and replacement. Each student will have a chance to work on all makes and models of HDD and see how to swap out heads and platters on them. There will be drives where the landing zone is on the platter and also drives with landing zone on teh ramp. This way the student can learn how to swap out heads on all types of hard drives. If you are interested in this advanced and full hands on clean room data recovery training courses, please feel free to contact us by sales@dolphindatalab.com.